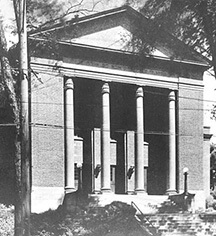 In 1921, the Temple Adath Yeshurun Jewish Congregation moved into a new synagogue at 601 South Crouse Avenue in Syracuse, New York. The Congregation, largely made up of Jewish German immigrants to the Syracuse area, had begun worshipping together in 1870. 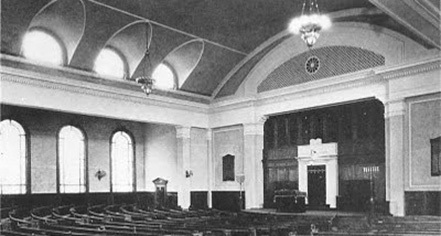 The Congregation met in the South Crouse Avenue synagogue until 1971, when they dedicated a larger and more modern space for the growing community. Two years later, the Salt City Center for the Performing Arts took over the historic building. The incorporated arts group was founded as a youth program in 1963 and grew to include multiple theaters, tech shops, classrooms, and more. With youth outreach and apprenticeship training, the group would put on performances that gathered audiences from a sixteen county radius. The Salt City Playhouse, as it was informally known, occupied the building until 2004. Named after his grandson, owner Norm Swanson of Hotel Skyler, LLC., acquired the building in April 2009 with plans to renovate the existing structure into an eco-conscious, sustainably-driven, green model for hospitality. The historic edifice of Gordon Wright’s original Temple is intact while unique details such as ornate historic stained glass windows have been added to enhance the hotel’s character. Other unique touches include the Treehouse Suites, where a percentage of revenues from these rooms help fund the local Golisano Children’s Hospital. In 2011, the hotel became the third in the United States and the first in Syracuse to be certified LEED Platinum. Hotel Skyler joined the Tapestry Collection by Hilton brand in 2017.